While faulty vehicle components are one of the most rare causes of car accidents, they do occur. When they occur, they are often incredibly dangerous and they can cause serious injuries. Auto defects can involve unsafe equipment, faulty parts, or even hazardous defects in the vehicle design that make them dangerous to drive. Faulty vehicle parts can render safety precautions useless, and in some cases, actually make the vehicles more dangerous during a crash. Every year, hundreds of drivers are injured in accidents caused by faulty auto parts. Some of the worst accidents have been caused by a malfunctioning safety device or other integral car feature. A well-known example would be the widespread Toyota recall. Several Toyota models were recalled due to floor mats that caused the accelerator to get stuck. Drivers were unable to stop their cars and some were in terrible accidents caused by this defect. Although many factors may be involved in an accident, an inability to stop a car clearly is a significant defect and a big risk. In the event that an accident is caused by a malfunctioning part or badly designed car feature, the consequences can be catastrophic. Far more common, but no less devastating, are injuries caused by a malfunctioning safety features in cars. Although the accidents in these cases are not caused by the defect, the damages are intensified by it. For example, if a seatbelt in a car does not stay clasped upon impact in a crash, injuries to a passenger will be much worse than those of a passenger using a functioning seatbelt. If the airbags, seatbelts, or any other safety features fail during an accident, these issues can cause severe injuries or even fatalities. Car manufacturers have a responsibility to design safe cars that are prepared to survive the damage of certain crashes. If the safety features of an automobile fail when they are needed most, car manufacturers should be held responsible. If a car’s safety features fail to perform as they should or if a design flaw in a car causes an accident, manufacturers can be held responsible for the damages and injuries the defects caused. Injured parties and their family members have a right to pursue personal injury or wrongful death claims for any damage done that would not have occurred if the parts were working correctly. Sometimes a malfunctioning part is not just caused by manufacturer negligence. Depending on what part malfunctions or why the malfunction occurred, the dealership where the car, truck, or motorcycle was purchased may be liable. In certain cases, manufacturers of individual parts or any mechanics who have worked on the part in question may also be legally liable. For example, imagine that a tire blows out, causing the driver to lose control of the vehicle on a busy highway. This accident may be attributed to a faulty tire, but the responsible party could be the dealership that sold the car with faulty tires, the tire manufacturer, or even the mechanic who installed the tire. 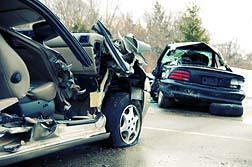 A thorough investigation of the accident will need to be done in order to determine the liable party or parties. Determining liability in the event of a vehicle part malfunction can be challenging. It requires a high burden of proof that is difficult to prove. That is why it is important to get the help of an experienced auto accident attorney to help you prove your case and pursue fair compensation. If you or someone you love has been injured or killed in a car accident, contact Van Sant Law, for your free consultation today. Van Sant Law, can help you get your claim settled as fairly and quickly as possible.